It’s true. 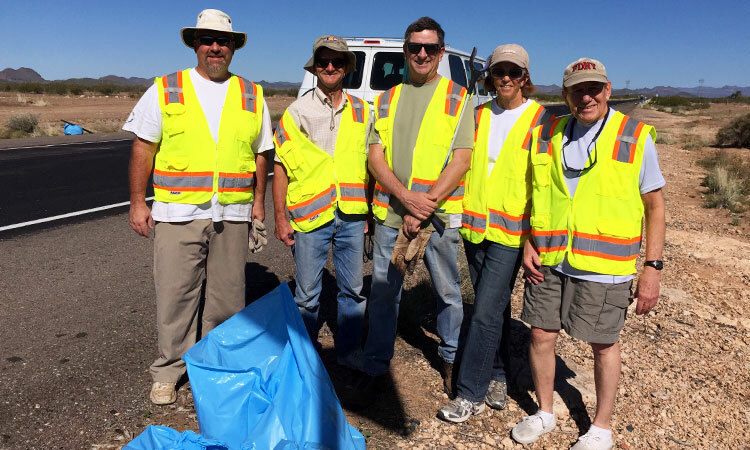 The first time AYC litter pickers picked the sides of Carefree Highway around the Lake Pleasant Parkway intersection, the junk stacked high. This time, the crew worked the west end of the Adopt-a-Highway length and completed the job in less time than expected (sending us off to Wild Horse for lunch that could have been called brunch). We do this a couple times a year to keep the highway clean (getting there) and to have the Arizona Yacht Club name posted on signs around the 25 mile marker. If you’d be willing to pitch in for a couple hours next fall, please contact Thom Dickerson, the smiling straw boss. Litter pickers on Saturday, March 28: Thom Dickerson, Peter Lehrach, Martin Lorch, Katherine Roxlo, Mike & Maryellen Ferring.